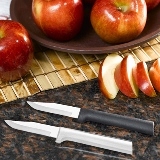 Knives, Sharpeners, and Cutting Boards | Country Lane Kitchens. RADA knives - a cut above - these are the knives our customers keep coming back for. Why? Firstly, they are sharp! A dull knife is not only a danger to use, it is a product mutilator and time waster. 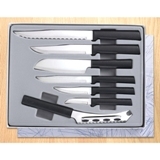 Secondly, they are exceptionally well priced for knives of this quality. 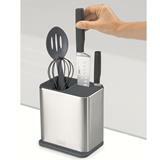 RADA also offers many preparation and serving tools and their selection continues to grow and improve. There are two choices of handle material - the original silver brushed aluminum handle which they have been making since 1948 and a stainless steel (black) resin handle that is dishwasher safe. The huge selection includes many elegantly boxed sets ready for gift giving. All RADA cutlery carries a lifetime guarantee. 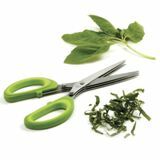 KUHN RIKON's specialty knives and multi-use shears bring lots of options and lots of colours to your kitchen. 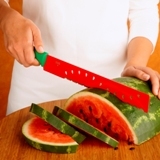 They have a non-stick coating in both plain bright colours and patterns, and a matching protective sheath to keep the sharp cutting edge from getting damaged. 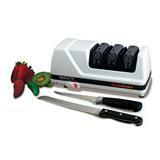 To keep all your knives in top cutting form, award winning Chef's Choice manual or electric sharpeners are a kitchen essential.